The word “snot” usually reminds me of a nasty cold – one I would rather get over and forget as soon as possible – but when it comes to Unicorn Snot, I absolutely cannot get enough of the shimmery, shiny glitter gel goo. Adding Unicorn Snot to my beauty regimen has added a touch of magic to my morning and keeps me feeling unique and expressive. You heard me right: magic. This glittery gel stuff really is like magic in the early mornings. At first glance, you might think the company actually had a bright, sparkly Unicorn sneeze into the jar, but alas, these fluorescent colors like bubblegum pink and neon lemon yellow are from much closer to home. The first question I asked myself while observing the specks of glitter goo: “I wonder if this will feel like snot? !” Well, the answer is yes, and big time! The unicorn snot is packaged in a large-sized glass jar, with and limited labeling, and package details. The jar lid tightens very well; I think it has to so that the glitter (unicorn snot) doesn’t dry out or go bad. Luckily for me, the scent is mild and just smells like gel – not bad or strong at all. I have found that with certain makeup products, the floral scents can be a bit overwhelming but not this snot. A really cool feature about these shades of colors compared to other roll-on glitter gel sticks is they are completely translucent: meaning, gone are the days when you would take off your glittery glam only to find bright, often hard to remove stains! Grab a tissue and wipe that snot right off quickly, easily and effectively. They also come in a fabulous glitzy array of colors for all your snotty needs. I also surprisingly found the long-lasting gel to be non-stick, perfect for a makeup klutz like myself. Not only is it safe for use on your lids, cheeks and lips, you can also use it in your hair (glitter braids, anyone???)! 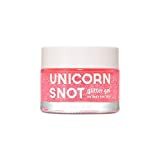 Unicorn snot is vegan and cruelty-free, which for someone like myself with 3 bulldogs, I love to see; cleanly no Unicorns were harmed in the harvesting of their snot. I’ve personally taken to using it for a spin on the party-ready glitter gel roots and glitter brows and highlighter (definitely a statement piece) that were first spotted at Coachella and other music festivals the past 2 summers. Are these looks practical for everyday? Nope. Pretty as heck to look at and experiment with? You bet. I would say the only downfalls to Unicorn Snot glitter gel is that the fluorescent bubblegum pink color I tried out was slightly harder to see on my extremely pale skin, than my roommates darker tones (as seen in video). I however do feel more than confident, so much that if I had access to FCTRY’s wide array of glitter gel snot products and colors, that I could easily find a color more suitable for my Casper-like complexion. The only other thing to note: the glitter gel goo did not dry as I had anticipated, so I would avoid using large amounts of thick snot. My rating: 5 stars! You heard it straight from the mystical horse’s mouth: Unicorn glitter ROCKS! Alex is a former New Englander living and loving life in the serene mountains of Park City, UT, has been published by the award-winning Mountain Express Magazine since 2012. A serial-thrill seeker, when Alex isn’t waist deep in powder or climbing that final ridge line, she’s chasing around her 3 mountain bulldogs!